With the current release RadPivotGrid supports only Microsoft.AnalysisServices.AdomdClient version 10.0. You can download it from here. After installing it, you will find the Microsoft.AnalysisServices.AdomdClient.dll under C:\Program Files (x86)\Microsoft.NET\ADOMD.NET00. ADOMD.NET is a Microsoft .NET Framework data provider that is designed to communicate with Microsoft SQL Server Analysis Services. ADOMD.NET uses the XML for Analysis protocol to communicate with analytical data sources. More information about ADOMD can be found here. RadPivotGrid can use AdomdDataProvider to get data from OLAP Cube. Cube - string property defining the exact name of the Cube. Database - string property defining the exact name of the Database. ConnectionString - string property used to open a database. It is in OLE DB connection string format. "Provider=MSOLAP;Integrated Security=SSPI;Persist Security Info=False;Data Source=ServerName;Initial Catalog=myDataBase;"
It is mandatory to use your Database name in the Database property and in the ConnectionString as Initial Catalog. If you do not set it in one of these properties, you will not be able to get the data from the server. Correct settings are shown below: ConnectionString="Provider=MSOLAP.5;Data Source=ServerName;Initial Catalog=DatabaseName" Cube="CubeName" Database="DatabaseName"
AggregatesLevel - set the position where groups for the aggregates should be placed. AggregatesPosition - defines whether the positon of the Aggregates will be Columns or Rows. AdomdDataProvider uses four different collections to design the view of RadPivotGrid report and RadPivotFieldList: RowGroupDescriptions, ColumnGroupDescriptions, AggregateDescriptions, FilterDescriptions..
You can define your AdomdDataProvider as a StaticResource in the XAML and then use it in both RadPivotGrid and RadPivotFieldList controls. The pivot namespace is URI namespace: xmlns:pivot="http://schemas.telerik.com/2008/xaml/presentation/pivot". It is mandatory to define it if you are using the AdomdDataProvider in your XAML. connectionSettings.Database = "Adventure Works DW 2008R2"
connectionSettings.ConnectionString = "Provider=MSOLAP.5;Data Source=ServerName;Initial Catalog=Adventure Works DW 2008R2;User Id=domain\user;Password=myPassword;"
When initializing the AdomdDataProvider in the code behind it is a good idea to wrap all modifications in BeginInit() - EndInit() section. This will cause only one refresh of the DataProvider and it will be when the EndInit() is reached. If you are applying only modifications (more than one) on already initialized AdomdDataProvider you should use the DeferRefresh() method which will cause delay of the Refresh and this way all your changes will be applied simultaneously. More information for these methods is available in our Populating with Data - Overview article. RowGroupDescriptions - the data added to this collection will show as Row Headers in RadPivotGrid. There is only one type of description that can be added to this collection - AdomdGroupDescription. ColumnGroupDescriptions - the data added to this collection will show as Column Headers in RadPivotGrid. There is only one type of description that can be added to this collection - AdomdGroupDescription. AggregateDescriptions - the data added to this description will be aggregated and included in RadPivotGrid as Cells. There is only one type of description that can be added to this collection - AdomdAggregateDescription. FilterDescriptions - the data added to this collection will be filtered based on a particular condition. RadPivotGrid will show only items that pass the filter condition. There is only one type that can be added to this collection - AdomdFilterDescription. 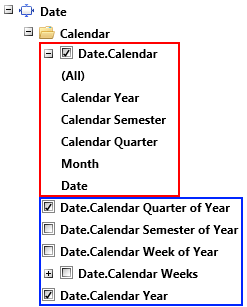 You can define a single filter condition or set up filtering for different levels of the selected member. The AdomdAggregateDescription is used to define data that has to be aggregated and that will show as Cells in RadPivotGrid. The data that should be aggregated is define with the MemberName property. For AdomdGroupDescription there are two ways (based on the data that will be used): "[DIMENSION]. [HIERARCHY]" or "[SET_NAME]".Note that the brackets are mandatory. aggregateDescription1.MemberName = "[Measures]. [Internet Order Quantity]"
As you can see, AdomdFilterDescription Condition expects object of type OlapSetCondition. Items property of the OlapSetCondition object is a collection of all objects that each item must match. In our case we are using string objects as the member names in OLAP Cubes are strings.